Set in 1 acre garden with LARGE HEATED POOL, Hall Farmhouse is an elegant period farmhouse in a picture postcard setting with the addition, in 2017, of a 'Grand Design' style extension to the rear of 120sqm kitchen, with level access to the pool and patio. The house has stunning views to the front over the award winning village green and pond and to the rear over several acres of rural fields. SWIMMING POOL: The swimming pool measures 20 x 40 ft . It's depth is between 4ft and 10ft. 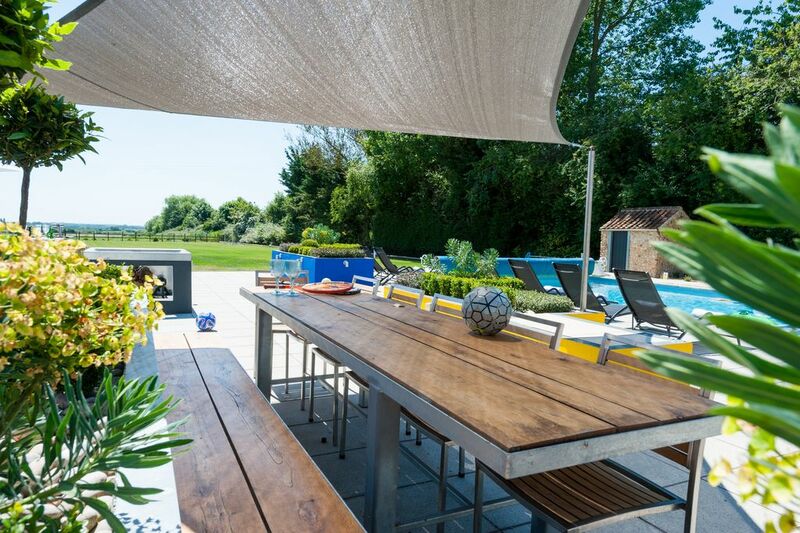 The pool is open and available from May to September weather permitting and can be heated on request at a charge of £30.00 per day (charges apply for the entirety of the rental period) . GARDENS AND LAND: Set in approximately 2 acres the garden has a large 15ft trampoline and a large private outdoor swimming pool with enormous patio with charcoal BBQ, table football and ping pong table. BOUGHTON VILLAGE: Boughton is a beautiful rural village and has been the recipient of 'best kept village' award year on year. The village centre is dominated by the village green and pond where an abundance of swans, ducks and geese contribute to the villages exceptionally pretty setting. On the edge of the village green there is a children's playground designed for under 10's. The village is surrounded by miles and miles of open countryside, ideal for cycling and walking. There are four bathrooms in total...one full family bathroom with separate shower, two en-suites on the first floor and a full bathroom on the ground floor. 5 Burner Falcon cooker, additional Miele cooker, dishwasher, larder fridge, freezer, washing machine and drier. Comfortable dining seating in kitchen for 12 with direct level access to patio area. Typically of a farmhouse of this age ( the house dates back to the late 1700's), there is a warren of rooms downstairs. These include a sitting room, tv room, dining room , huge kitchen diner, laundry room and downstairs bathroom. In addition, there is a small side room which the owners retain for storage of their personal effects, this does not affect the flow of the house in any way. The kitchen has a large 5 burner Falcon cooker and an additional Miele. All bed linens are provided, together with towels and pool towels. Games Console is an X Box with 2 controllers. Smoking is strictly prohibited inside the house. Pets are welcomed by prior arrangement. High chair and travel cot available on request. All bedrooms are on the first floor. Stayed here for father's 70th birthday celebrations. Fantastic place with room for all to relax and enjoy. Kids enjoyed the pool and the huge garden area playing football and using the trampoline. Very versatile accommodation the Kitchen area is lovely for large social area with other rooms available to use for a more relaxed time. All great sized bedrooms and comfy beds. Bathrooms and showers all done to a very high standard. Very quiet location but just short drive from restaurants and pubs serving good food. Would recommend organising a large supermarket delivery as no local shop to walk to which I usually like but have to say didn't miss this time. Owners very nice and helpful so we're the cleaners and maintenance guy. We stayed at Hall Farm House over the New Year break and we had an amazing time. The cottage was beautiful and very spacious and accommated 6 adults and 5 children ( ages 1 to 5) to room to spare. The garden was huge and there was lots for the kids to do with the duck pond and playground just outside. Sandra was really friendly and helpful. The cottage was very homley with the open fires and big farm house kitchen. We would love to come back in the summer and make use of the out door pool. I would recommend this cottage to anyone who wanted to get away and spend quality time with friends and familiy. We stayed here for my 30th birthday - it was a surprise and when we arrived I was amazed by the views and the spacious feel to the house. The kitchen was amazing and sulfilled every need for our very successful dinner party. The games room kept our 3 children very happy all weekend and the heated pool kept everyone happy. The beds are so comfortable and the sheets so crisp and clean. Thank you very much for a wonderful stay, we will be sure to stay for a more relaxing weekend/week next time. I stayed at Hall Farmhouse over New Year with a large group of friends and the house was even more lovely than we had imagined it would be. It is very spacious and atmospheric, with real fires, an enormous and excellently equipped kitchen and gorgeous bedrooms. The garden and surrounding area are delightful- we had some lovely walks and enjoyed feeding the local ducks! The owners of Hall Farmhouse were welcoming and helpful all throughout the booking process and during our stay. I would recommend this house to anyone- from families to groups of friends. We spent a long time searching for the right house to celebrate my Mum's 60th birthday and then we found Hall Farmhouse. We were quite fussy about our requirements, we needed space, but we wanted to be able to all get together for dinner & board games. We wanted to get away from it all but not be too far from civilisation. We were very fortunate in finding this house and thoroughly enjoyed our visit. My Mum's birthday was extra special with all the family ( especially the Grandchildren) around her and we didn't ask her to cook once! This house feels like a real family home only on a grander scale. We never felt like we got in each others way. Boughton is so picturesque and we enjoyed some fabulous long walks in the surrounding countryside. We only wish it had been warmer so we could have taken a dip in the huge pool, maybe next time. We stayed at Hall Farm House in early december. The owner's were very gracious and most helpful to our needs. It was the perfect setting for a rustic, cosy weekend a clean and well - maintained period property. The picture postcard setting was even better than we expected, although we weren't brave enough to use the pool, we opted for snuggling up to a roaring log fire instead!!! Hall Farmhouse, in the picturesque village of Boughton, is situated approx 6 miles from the town of Downham Market where the rail connection to Kings Cross runs every hour and takes 80 minutes. The Cathedral town of Ely is approximately 20 mins drive from the house and Norwich and Cambridge are both within a 45 min drive. Golf: TWO EXCELLENT GOLF CLUBS, OPEN TO NON-MEMBERS, LOCATED WITHIN A 10 MINUTE DRIVE.....SWAFFHAM AND DENVER.